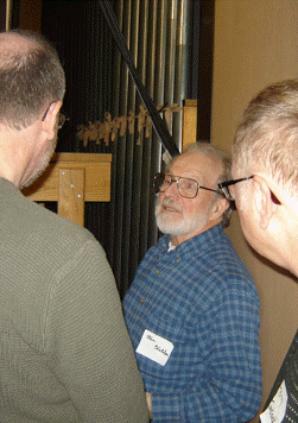 Jim wilkes is dwarfed by a covey of exposed pipes. Tim Huth suggests some stop combinations for Ray Ahrens. 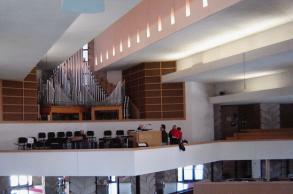 Ken Holden provides an overview of the organ and changes by Casavant, Pilzecker and Jerroll Adams. 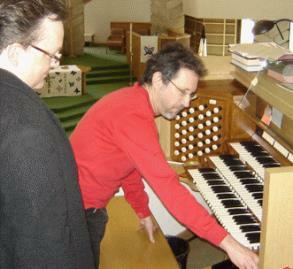 Ken Holden reveals some pipework in the opus 1427 organ chamber. 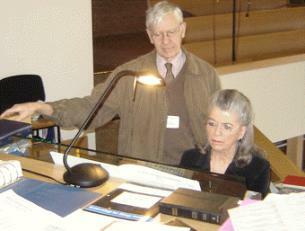 Brian Sweetman, Jim Wilkes and MaryAnn Balduf look at the bulletin from the organ dedication service in 1965. 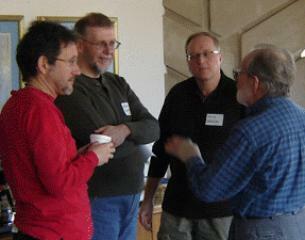 Tim Huth, Brian Sweetman, Terry Jankowski and Ken Holden gather around the coffee urn in the choir room. 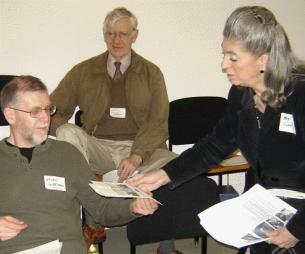 MaryAnn Balduf plays as Jim Wilkes provides encouragement. 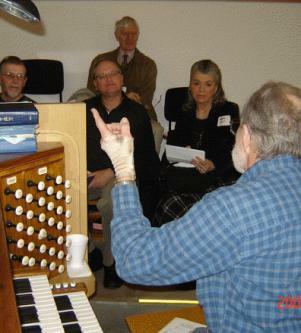 Chapter President Carl Balduf called the March 29, 2008 meeting of the Michigan Chapter of the Organ Historical Society to order at 9:45 a.m. at First Presbyterian Church of Dearborn, Dearborn, Michigan. 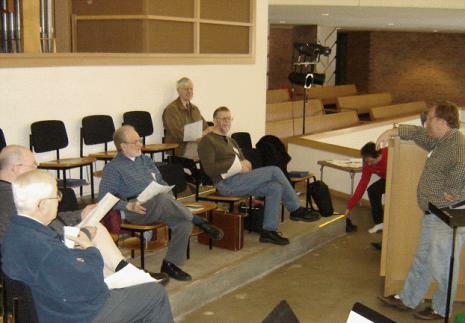 Present were Ray Ahrens, Carl Balduf, MaryAnn Balduf, Ken Holden, Terry Jankowski, Jasper Pennington, Art Snook, Brian Sweetman, Jim Wilkes, Marshall Dicks, Director of Music for the First Presbyterian Church of Dearborn and Timothy Huth, First Presbyterian Church Organist. The meeting began with an invocation by Fr. 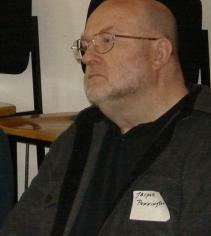 Pennington, after which Balduf requested approval of the minutes of the October 13, meeting, as posted on the Web site and provided in printed form at the meeting. Approval was moved and seconded. The motion carried. Treasurer Terry Jankowski presented the Treasurer's Report, available below. 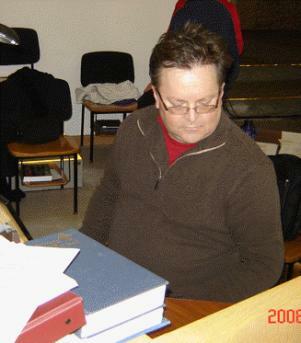 Balduf reported that the O.H.S. National organization is concerned that some chapter members are not national members. In response, Balduf passed around National brochures and suggested that these be further passed to others (since all members present are members of the O.H.S. national organization). 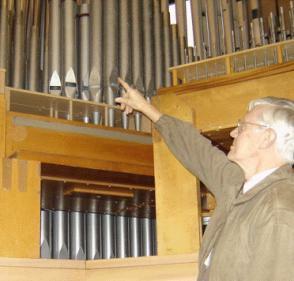 Ken Holden reported on work on the Casavant at the Detroit Institute of Arts, recounting how the replacement of rotting wooden air ducts resulted in the wind pressure being restored, which uncovered other problems yet to be addressed. Balduf said he would contact the DIA to see if they wanted to continue with the application for an O.H. S. Certificate of Merit. Terry Jankowski then read a letter from Robert J. Scott, Station Manager of WRCJ-FM, thanking the Chapter for its $500 contribution in support of Pipe Dreams on WRCJ. Read the Letter. Jankowski also provided directions to the April 26 meeting. These have been added to the meeting notice page. There being no further new business the meeting was adjourned at 10:15 a.m., after which Balduf introduced Marshall Dicks, Ken Holden and Timothy Huth who jointly presented an overview and demonstration of the 1964 Aeolian-Skinner Organ, opus 1427. All in attendance received a copy of the original Opus 1427 specification. Following the extended open console, members of the group enjoyed lunch at the Bob Evans restaurant in Dearborn (from left, Brian Sweetman, Carl Balduf, MaryAnn Balduf, Timothy Huth Terry Jankowski and Ken Holden).